In 2005, Roger Dubuis launched Excalibur, a line that has written some of the most beautiful pages in the history of horology. Its dynamic forms, its sharp angles and the sheer power of its designs have reshaped Fine Watchmaking. In 2013, the brand honours this iconic collection with some exceptional creations including the Excalibur Round Table timepiece. The Knights of the Round Table had a solemn motto “Courage and generosity”. This motto succinctly captures the life philosophy at Roger Dubuis. Drawing inspiration from the exploits of King Arthur’s knights, the Geneva Manufacture has created a series of 88 exceptional pieces distinguished by their boldness and steeped in history.Created with meticulous craftsmanship, twelve of these heroes, armed with their faithful swords, have been cast in gold to form a perfect circle around a magnificent dial in grand feu enamel. Underneath this ‘round table ‘ beats the heart of the automatic movement RD821. The scene is highly symbolic; the adventures of the famous knights were planned while seated at a round table. From the Middle Ages to the modern day, the legend of the Wizard and the Knights of the Round Table has always been very popular. The story of their exploits has marked history and honoured the cardinal values of strength and respect. 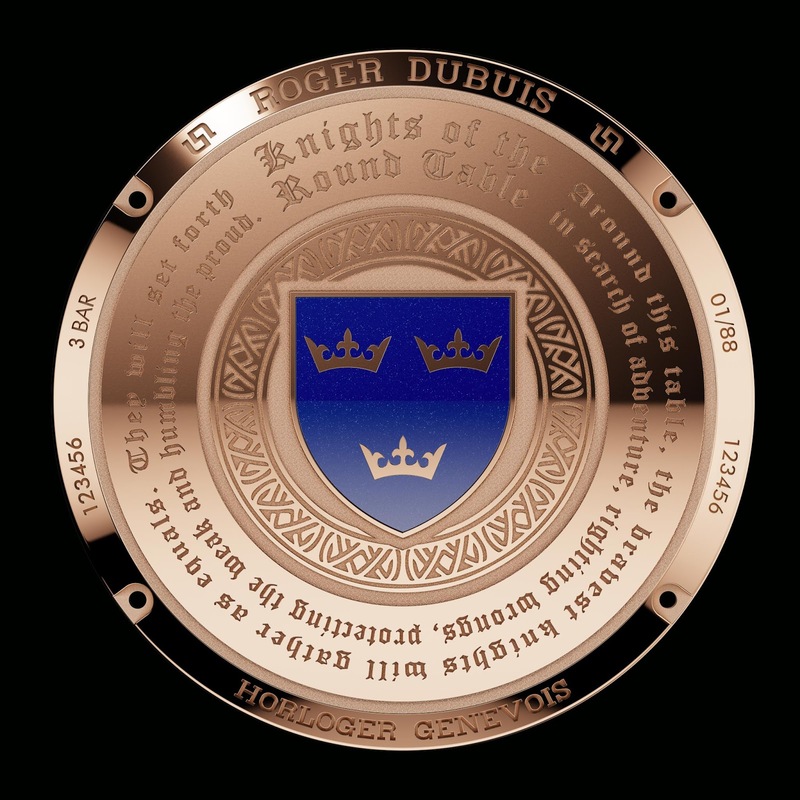 Roger Dubuis designers have drawn their inspiration from a reproduction of the Round Table made for Henry VIII and placed in the Grand Hall of his castle at Winchester. 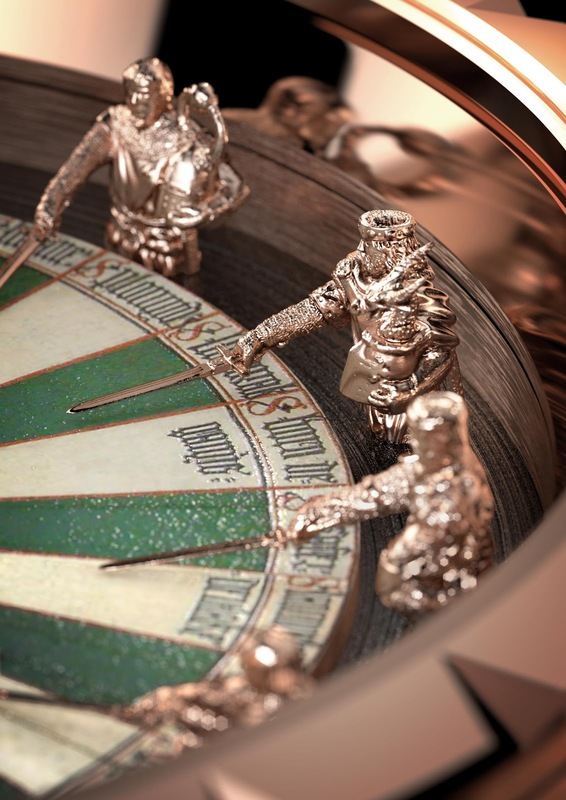 The legend of King Arthur has been the inspiration for the Geneva watchmaker’s latest wonderful creation: the Excalibur Round Table. 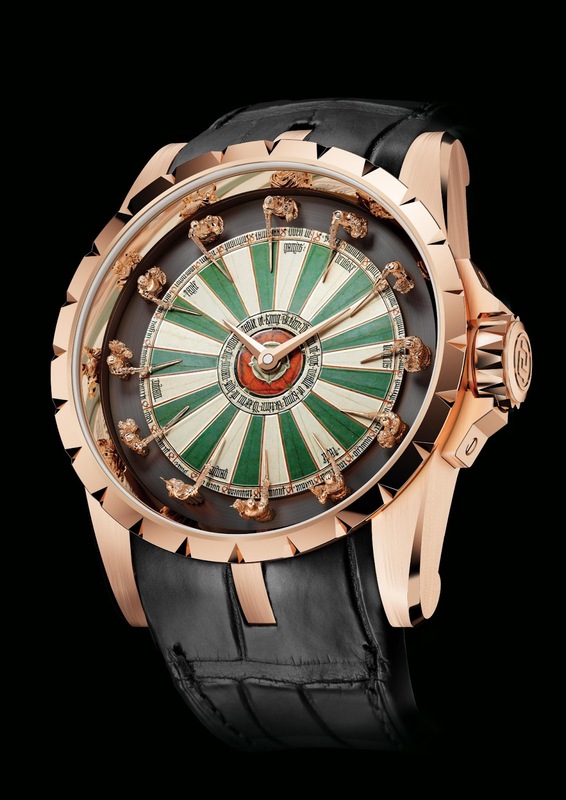 Produced in a limited series of 88 pieces, this watch presents a perfect reproduction of a scene from the Round Table. It fits the legend with its 45 mm case in pink gold and respects the design codes of the Excalibur collection: over-sized case, fluted bezel, robust crown guard and triple-horn strap attachments. With its dynamic shape and sharp angles, the watch has a dial to match its strong, symbolic design. Twelve figures representing the legendary Knights of the Round Table with their swords make a perfect circle replacing traditional hour markers. Each figure is a three-dimensional casting in gold with its fine details carved by hand. This breathtaking miniaturisation, the work of highly skilled passionate craftsmen, produces 12 quite different knights, only 7 mm tall. This watchmaking masterpiece is a unique example of its kind, made with a precision that can only be appreciated by examining it through a jeweller’s eyepiece. The artists worked closely with watchmakers to create this alliance of both traditions. In the centre of the scene, a dial in precious grand feu enamel forms a kaleidoscope of colours that adds even more to the evocative power of the piece. On the back of the watch, the solemn oath, together with a lacquered coat of arms, is engraved in a circle as a tribute to the bravery of the Knights of the Round Table. Among its list of technical achievements is the latest generation of the automatic-winding mechanical movement, the RD821 that displays the hours and minutes. And because Roger Dubuis is committed to the ceaseless pursuit of excellence, the movement and the complete watch are stamped with the prestigious Geneva Seal.